Here’s a place to keep all this together. It’s an important issue tissue of lies, since the warmists are making a great deal of it and I’m sure a lot of otherwise well-informed people have gained quite the wrong impression from the lies put about by scientists like Gavin Schmidt and Mike Mann that the temperature has been rising for years. Richard C (hi, Richard!) has contributed a whole lot of comments to this discussion and, because even if I can’t recall all his points just now, they deserve sensible archiving. Shortly I’ll move the relevant comments from the Paris Climate Party post. NIWA must be gutted NZ didn’t join the party. That was 2014. 2015 looks about 0.75.1779 was warmer than that. I’m starting to wonder where on earth was “warmest ever” in 2015. New Zealand, Australia, Central England, contiguous USA, not even close. So where in the world was 2015 warmest ever? United Kingdom: 2015 was nowhere near warmest ever, 2014 was – UKMO data. Central England: 2015 was nowhere near warmest ever, 1779 was warmer than 2015 – UKMO data. United States: 2015 was “2nd warmest year for Contiguous US” – NOAA/NCDC. No explanation for this from Grant Foster (of course). South America and the Middle East, and parts of the US, Europe, and Asia. Too bad NIWA, BOM, UKMO, NOAA, and presumably ECCC didn’t get the memo. Mixed messages. Apparently 16.9% of Earth’s surface defines “global” warming. And note the “Record High” in the Amazon hinterland where there are no thermometers (see spacial plot). So where was 2015 warmest ever according to BEST? American (+1.18 C) and Asia (+1.63 C) as a whole. It would be interesting, if possible, so see if the respective national authorities corroborate Berkeley Earth. I would have thought that delivery of an internally consistent message was the objective. And what will Robert and Elizabeth be saying if/when this strong El Niño is followed by a strong La Nina as generally occurs? I think BEST’s reports on 2016 and 2017 will make interesting reading if this effort is anything to go by.. According to the Finnish Meteorological Institute statistics, 2015 was a record warm year in the most parts of the country. Lapland was the only province in which the year was not quite the warmest but in the shared second place. The mean temperature in 2015 was 4.2°C, which is about 1.9°C warmer than the long-term average i.e. the period 1981–2010. As regards the whole country, only June and July were colder than average. February and March as well as November and December were proportionally the warmest periods as the mean temperature in the whole country was 4-6°C warmer than normal. Lapland is 29.25% of Finland land area (98,984/338,424). 2015 does not look like eclipsing 2014 in that series. In the following comment which is the 2015 European climate bulletin there is no mention of any record for Italy. I have my doubts about the data quality for Ethiopia and Vietnam i.e. not worth looking into. The year 2015 will be the second hottest on record in Europe, with mean annual temperatures just above the 2007 average and below the record set in 2014, according to an analysis by one of the World Meteorological Organization’s regional climate centres. Much of eastern Europe was exceptionally warm, with temperatures higher than in 2014. Only in parts of Ireland were temperatures lower than the 1981-2010 long-term average, according to the Climate Indicator Bulletin [see below] from WMO’s European Regional Climate Centre node on Climate Data operated by the Royal Netherlands Meteorological Institute, KMNI. A map (Figure 2) of the annual mean temperature for 2015 with respect to the 1981-2010 long-term average shows that most of Europe was warmer in 2015 than usual, with a pronounced west-east temperature contrast. Much of eastern Europe was exceptionally warm, warmer even than 2014 (which is Europe’s warmest year on record). West European countries were on average cooler, but still show higher than usual temperatures with the exception of parts of Ireland where lower than average temperatures were observed. The temperature anomalies (with respect to the 1981-2010 long-term average) show large contrasts over Europe in all seasons. Striking are the below-average temperatures in Spain and Portugal in winter, the cooler than usual summer in northern Europe and the persistent coldness in Ireland. Spring was particularly warm in Spain, where in mid-May unseasonably warm temperatures of 40°C were reached in many parts of Spain. Exceptionally hot conditions in Spain at the end of June, with 44°C reached in Cordoba and a new Madrid July record, spread north and east bringing heat waves to central Europe. Paris saw very hot weather with about 40°C; Germany broke an all-time record for hottest day of the year and Switzerland also had its second warmest week ever (behind the 2003 value). Although the warmth was very persistent in east Europe, the contrast with the rest of the continent ranked the summer of 2015 as only the eleventh warmest on record. During autumn, only November was warm throughout Europe, contributing to having in Autumn 2015 the smallest temperature contrasts in Europe. Overall, Autumn 2015 ranks as the third warmest on record. This corroborates BEST’s record warm 2015 year in Ukraine. This doesn’t offer any corroboration for BEST’s record warm 2015 year in Italy. >”The temperature anomalies (with respect to the 1981-2010 long-term average) show large contrasts over Europe in all seasons” including “below-average”, “cooler than usual”, and “persistent coldness”. So much for Robert Rhode’s “rise due to greenhouse gas emission”. Figure 1: Graph of annual (Jan-Dec) averaged daily mean temperature averaged over Europe, with respect to the 1981-2010 climatology. Temperatures below normal are in blue, temperatures above normal are in red, with the 2015 value in green. The change to a warmer regime only began in the late 1980s. That graph is basically the IPCC’s anthro attribution timeframe 1950/51 – 2010 (6 decades) plus up to date data but there was no change over the first 3.8 decades of it in Europe. And not much change over the last 1.8 decades of it either. Just realized (duh) that if KNMI rank 2015 2nd warmest in Europe, BEST’s warmest ever records for Finland, Italy, and Ukraine are irrelevant. The rest of Europe e.g. ““persistent coldness” in Ireland, pulled down the average to 2nd rank. That eliminates Europe, USA, United Kingdom, Canada (probably), Australia, and New Zealand. These are all good quality datasets and a major portion of the earth’s surface. Once the “warmest ever” claim is dependent on places like Ethiopia, Vietnam, and Brazil then the credibility of the claim becomes a bit stretched..
That is a huge El Nino spike that will inevitably return to neutral and probably a La Nina over the next 2 years. UKMO differ from the others in that they provide a spacial map showing the grid cells with missing data. Where BEST contrives to create “data” in these places, UKMO doesn’t. This includes some of South America and Australia, much of Africa and Greenland, and most of the Arctic and Antarctic. The 2015 global anomaly raises the same questions as BEST. What countries (or sea surface) contributed to the “warmest ever” average and do those countries actually corroborate HadCRUT4? El Nino yes, “human influence” no. 2015 ranks #2 according to KNMI. The UKMO HadCRUT4 report does not provide a CRUTEM4 – HadSST3 breakdown i.e. a land/ocean split. I suspect, given the HadCRUT4 anomaly map and the national reports, that the entire global metric is skewed by the Eastern NH Pacific SSTs i.e. the “blob” (yes, this is the scientific term). CRUTEM4 (land) is nowhere near warmest at end of October 2015 but HadSST3 (sea surface) is warmest. In other words, the “warmest ever” claim for 2015 is a sea surface temperature phenomenon, NOT an atmospheric air temperature phenomenon over land i.e. “human influence” cannot be a factor contrary to Phil Jones spin. Confirming once again that Phil Jones is a phoney. November and December CRUTEM4 data will have to be a remarkable spike to eclipse the 2007.00 1.652 anomaly (possible but unlikely I think). More likely is that the bulk of the HadCRUT4 spike will come from HadSST3 with an additional peak from CRUTEM4 but not greater than CRUTEM4 2007.00 (but could be wrong). I can imagine their balloon deflating on learning that for 10 months of 2015 at least, there was no atmospheric component in the 2015 “warmest ever” record. This data is not in dispute and is not subject to any NOAA adjustments. 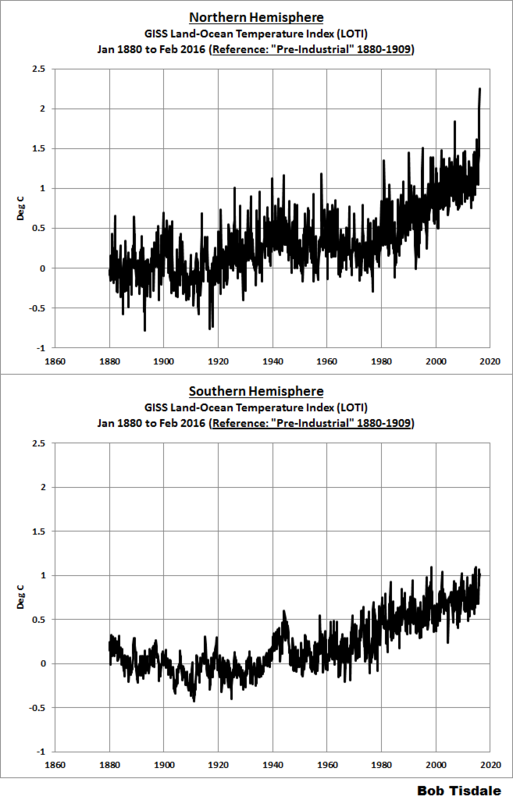 Claims that 2015 was a hot year in the US are simply fraudulent. I’m referring to the issues upthread, not to satellites. Bryan Leyland stuffed up in the first comment at HT over this He should be following THIS blog. Heh, except the observed earth’s energy imbalance is not playing along with theoretical radiative forcing and in fact falsifies the man-made climate change theory in terms of the IPCC’s own criteria. I’m reasonably confident Gareth is oblivious to that too. Crisis? I don’t think so. Throw in the towel? We have already won according to the IPCC’s climate change criteria, and that’s not temperature. The 1998 El Nino spike was “cherry picking” to create the “pause” (that doesn’t exist). This isn’t even true, but then the 2015/6 El Nino is proof that AGW is real and dangerous and that the pause that doesn’t exist has now ended, even though “climate change” is defined over 30 year periods. Greenpeace executive director Russel Norman said the results are evidence that climate change is definitely happening right now, and commented the implications for an island nation like New Zealand are “disturbing” to have to consider. >”climate change is definitely happening right now”? >”disturbing” to have to consider? New Zealand in 2015 was “the 27th-warmest year since 1909” according to NIWA. What exactly is “disturbing” about that? Neither was 2015 warmest in Australia (5th), Europe (2nd), USA (2nd), UK (not even close), Canada is unlikely to report a record given 2014 was “the 25th warmest ….since …. 1948”. It’s just not an atmospheric phenomenon either at adult nose height above land as measured by thermometers (see CRUTEM4 Jan – Oct upthread) or in the lower troposphere as measured by satellite (see RSS, UAH). The 2015 spike starts in sea water temperature in the NH Pacific (HadSST3) and only effects the air above surface in the last 2 months of 2015. That is NOT “climate change”. Yes, what Peter Hannam at SMH and Jonathan Chait at NYM don’t realize is that all sceptics have to do is wait. We wait for the data for 2016. Then we wait for the data for 2017. We wait to see if there’s a La Nina following. We wait for ENSO-neutral conditions to see where that takes the trajectory of the data..
Having waited, we then get to witness all the warmist weaseling in the ensuing years with some satisfaction. And we’re patient, because that will be fun. Noaa says 2015 was 0.16°C+/-0.09°C warmer than the previous record which was 2014. 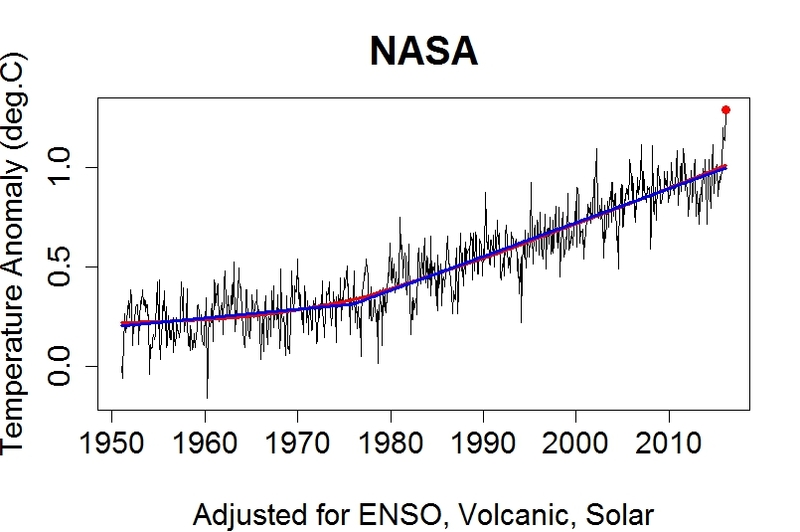 Nasa says that 2015 was 0.13°C+/-0.10°C above 2014. The UK Met Office said that 2015 was 0.18°C +/- 0.10°C above 2014. Nasa made a key statement; “Only once before, in 1998, has the new record been much greater than the old record by that much.” This clearly because 2015 was like 1998 a strong El Nino year. Because of this it is unwise to use 2015 in any trend analysis. It is essential to view the 2015 along with subsequent years to catch the cooling La Nina effect. Only this way can the El Nino contribution be properly assessed. Using 2015 to increase the trend of recent years is unsafe. Remember when some analysts used 1998 as a start point for global temperature trend analysis they were rightly criticised for it. It now seems that some are using a strong El Nino year – 2015 – as the endpoint for their analysis! Not showing such caution the director of Nasa Giss, Gavin Schmidt said, “Last year’s temperature had an assist from El Nino but it was the cumulative effect of the long term trend that has resulted in the record warming we are seeing.” This assertion is not supported by the Nasa Giss data. In 2015 no month between January – September set a record for that month. All things considered it seems that some have forgotten the viewpoint expressed frequently when adjacent years changed little in global temperatures; one can read too much into a single year. A fuller analysis will be published subsequently. THE USA, one of the world’s biggest producers of carbon, did not experience its hottest year on record in 2015, bucking global trends which suggest post industrial revolution activities are warming the planet. NASA, the National Oceanic and Atmospheric Administration (NOAA) and weather experts all today released data which recorded 2015 has the hottest year since records began in the 1800s, but average temperatures have risen by just 1°C since 1850. But the provisional results, which scientists unanimously accept are higher than normal due to the El Niño effect which began last year, include some anomalies including areas of cooling and where records were not set such as in North America. Todays announcement that a major developed nation like the US did not experience its hottest year ever is likely to fuel the argument put forward by many US-based climate sceptics that human activities simply do not have the level of impact being claimed by the climate change lobby. NASA and NOAA scientists were forced to accept that El Niño was partly responsible for the overall record busting year and that some areas had not been as affected such as the states. A NASA spokesman said: “Phenomena such as El Niño or La Niña, which warm or cool the tropical Pacific Ocean, can contribute to short-term variations in global average temperature. “A warming El Niño was in effect for most of 2015. “Weather dynamics often affect regional temperatures, so not every region on Earth experienced record average temperatures last year. But NASA’s GISS Director Gavin Schmidt argued the results were still significant. He said: “2015 was remarkable even in the context of the ongoing El Niño. NASA also said most of the warming occurred in the past 35 years, with 15 of the 16 warmest years on record occurring since 2001. The UK Met Office also today admitted the El Niño effect was partly responsible for 2015 breaking previous post-industrial records, but said climate change was also to blame. El Niño is an occasional weather phenomena, when temperatures rise in the Pacific, causing weather chaos across the globe, including increased temperatures, floods, storms and in some cases freezing winters. Scientists at the Met Office Hadley Centre and the University of East Anglia’s Climatic Research Unit today said provisional full-year figures for global average temperatures reveal that 2015 was the warmest year in a record dating back 165 years. The UK was nowhere near warmest ever either. Europe was 2nd warmest too along with USA. And so the meme falls apart for the warmies. THE weather in 2015 was dominated by the effects of a slowly-building El Nino which, by the end of the year, was measured as being as strong as those in 1981 and 1997-98. It delivered a cooler year overall, with the mean annual temperature cooler by a third of a degree. There were 41 days of 25 degrees or higher compared to 52 such days in 2014. The top temperature was 29.7 on February 3 compared to 31.6 on January 16, 2014. It was a lot frostier. There were 76 mornings where the grass minimum fell to zero or below, compared to only 44 in 2014. Russel Norman finds this ”disturbing” to have to consider. temperature.global [http://www.temperature.global/] calculates the current temperature of the Earth. It uses unadjusted surface temperatures. The current temperature is the real-time surface temperature of the Earth. The 12M average is the mean surface temperature over the last 12 months compared against the 30 year mean. New observations are entered each minute and the site is updated accordingly. This site was created by professional meteorologists with over 20 years experience in surface weather observations. Hmmm….. 2015 average 0.54°C BELOW the last 30 years mean. These would be land-only stations including islands e.g. Pacific island stations effectively capture Pacific air temperatures without recourse to sea water temperatures. Should point out that this is no different to NIWA’s proprietory Virtual Climate System Network (VCSN) covering New Zealand. You have to pay to subscribe to that. Hello Richard T, thanks for doing this. I realize your new lifestyle block is probably taking up quite a lot of your lifestyle these days. The earth’s temperature has risen 3°C in 3 days. The UNFCCC wont be happy about this. The section isn’t big enough to be called a lifestyle block, it’s just under half an acre, but we’ve got two families on it and there’s a lot more to be done than before. Quite a few things are different now we’re in Te Puke, like chickens and a proper garden and orchard. We have to replace the downstairs kitchen floor because of a hot water leak that occurred as soon as we moved in. Ah well, it was always part of the refurbishment, it’s just sooner than expected. Now the new office furniture just arrived so I’d better assemble it all. btw, I hope you’re not far away, it’d be great to get together for a chat. Their most cited graphs show a thin black line for their “measurements” with zero error! While showing a wide yellow band for climate simulations. Carl Mears [RSS] has been actively pointing out that the surface tempo record is more accurate than his satellite data. See Climate Crocks for a video. RSS to “correct” UAH (RSS “useful as way of keeping the UAH guys honest” – Renowden). The poor Bozos at HT (excepting Andy, Bryan should know better) don’t realize that it is not necessary to bring up satellite observations in order to pull apart “Hottest year ever was 2015″ in the major land+ocean surface series as upthread. So he would agree with this then from upthread? A President Cruz (or Trump) won’t have to look far for those budget cuts. If it fits the narrative, use it. Has not updated their temperature graphs on their home page since 2013!! It is a hoot is it not that they are now over two years behind. This is partly what allows dumb wits to cite the RSS data of the recent decades and claim that it shows “no warming”. While the data include the ElNino of 1998 they are so far blind to 2014 and 2015, which broke all records. I have been in discussion with Mears and hopefully, we will see an update of the RSS climate homepage sometime soon to reflect the latest data, which might put and end to the abuse these data endured by the denier sphere. Okaaaay, lets see who is “blind”, who is “behind”, and who is the “dumb wit” (without even “digging a little deeper” for the most recent data – but see below). woodfortrees is never quite up to date but it is up to 2015.92 for RSS (end of November). I don’t think Thomas is going to like what he sees (again) when RSS updates their website. The post leads with RSS and graphs to end of 2015. The graph clearly shows the data source link at the RSS website. Note the post also includes the earth’s energy balance and the discrepancy between observations and theoretical anthropogenic forcing at top of atmosphere. This is the IPCC’s primary climate change criteria, not temperature which is a secondary effect according to the IPCC (imbalance “controls” temperature). Turns out, by Thomas’s own reasoning, that Thomas is “blind”, “behind” and a “dumb wit”. RT, busy as I guessed. 20 km about. Unless my plans change I’ll be at EastPack’s Quarry Rd Te Puke site at the North end of town next week (either 3rd, 4th, or 5th Feb, probably morning of Wed 3rd) to apply for the 2016 packing season (they want me back apparently). Don’t know what I’ll be doing but I’m guessing it’ll be physical given they’ve ripped out the automation on the machine I was on last year because it was more trouble than what it was worth. Means about 30 more people per shift reqd just on that machine. Mostly grunt (stackers) to do what the robots did, that’s not me though. I’ll email you on Monday or Tuesday. I can easily call in anywhere in Te Puke sometime after I’ve finished at EP. Carl Mears in the Crocks video claims that anthropogenic climate change is visible in the satellite data, despite admitting that it shows no warming and is less accurate than surface data. That was a 0.7°C drop in one month from 2007.00 to 2007.08. Temperature.global (see upthread) is currently (Jan 26th) returning “6.54°C below normal” for land meteorological stations, so there is every reason to expect a repeat in CRUTEM4 similar to January 2007. So having got all fizzed up over 2015, the warmies are about to come back to earth with a thud. Dellingpole on The End of Snow. And then on the weaseling post massive snow dump. #2 Probably not 2014 alone. more like 2009/10, 2005, 2001/2, or 1997/8. [RSS is] useful to know how the atmosphere is warming at all sorts of levels, even if it’s not a measure of the temperature where we live. We don’t live just below the sea surface either. The fact that it took an usually long time (7 years, until the 2005 global temperature record) for the 1998 record to be matched or exceeded is related, in our analysis, to the fact that it occurred earlier than expected given the trajectory of anthropogenic warming. Huh? The 1998 El Nino was “earlier than expected”? And what exactly is their “trajectory of anthropogenic warming”? This can only be the MDV-neutral (by default) CO2-forced model mean trajectory, NOT the observations residual as implied by Mann et al. Unfortunately the model mean is running far too warm in comparison to the MDV-neutral observation residual e.g. with 5-year smoothing to eliminate ENSO and subtracting MDV cyclicity. I could have saved them a lot of trouble just by stating “The Likelihood of Recent Record Warmth” should be self evident given the highest solar activity in 11,000 years (Usoskin) lagged through the ocean and overlaid by a multidecadal oceanic oscillation. Expect the land+ocean warmth to continue to at least 2020 in view of the cyclicity. The model mean – observations temperature discrepancy shows theoretical anthropogenic climate forcing is superfluous, as does the observed earth’s energy imbalance compared to theoretical anthropogenic forcing. 2014 doesn’t rank by itself. And comparing nominal years e.g. 2014 to 2015, instead of 12 months of data overlapping nominal years e.g. 2014/15 to 2007/8, doesn’t tell us much. Mann et al (note Stefan Rahmstorf is in on this) are scientifically fraudulent if they are purporting the “trajectory of anthropogenic warming” is the observations residual after removal of transitory effects – it isn’t, the CO2-forced model mean is. The misrepresentation does seem to be their message although I’ve yet to isolate a quote that shows this explicitly (I’ll look again tomorrow). Foster and Rahmstorf implied the same with their 2011 paper and its (near) MDV-neutral residual. Now Rahmstorf is back to his old tricks again, this time with Mann (who else?). I represents the internal variability component (often called “noise”). Dead wrong assumption. T from observations does NOT include A. When A is factored in, as per CO2-forced models, MODELED T, which is observed T + theoretical anthropogenic forcing A, is GREATER THAN the observed T.
Hard to know if they are actually knowingly purporting a scientifically fraudulent representation, or it’s just that they have not got a clue what they are doing. GMST(modeled) = A + N + I…………(1) Mann et al’s model is T = A + N + I except T is assumed incorrectly. GMST(modeled), model (1), corresponds to the model mean where MDV is neglected. GMST(natural), model (2), corresponds to GMST(observed). Even the IPCC concedes GMST(modeled) is GREATER than observations in AR5 Chapter 9. 1) Solar change (and volcanism – except there was no major volcanoes). Too little and too early for an effect. 2) “Natural variation” i.e. MDV. It is neglected. Sceptics have been yelling this in their ears for years. 3) “Too sensitive” to CO2 forcing. They can’t come out and say CO2 forcing is superfluous. As time goes on it will become all too apparent that the IPCC’s model paradigm where solar change takes a back seat, MDV is neglected, and CO2 forcing is superfluous, is wrong. 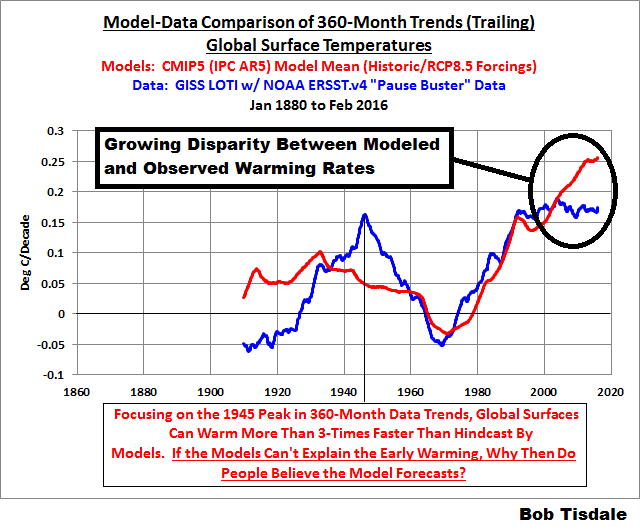 That the hottest year ever was 2015 does not validate the models, it is just an illusory spike. It is true that global warming might be a partial cause of the anomaly sequence. Indeed, every working scientist assumes, what is almost a truism, that mankind has some effect on the climate. The only question is: how much? And the answer might be: only a trivial amount. Thus, it might also be true that global warming as a partial cause is ignorable for most questions or decisions made about values of temperature. How can we tell? Only one way. Build causal or determinative models that has global warming as a component. Then make predictions of future values of temperature. If these predictions match (how to match is important question I here ignore), then we have good (but not complete) evidence that global warming is a cause. But if they do not match, we have good evidence that it isn’t. Predictions of global temperature from models like CMIP, which are not shown in Mann, do not match the actual values of temperature, and haven’t for a long time. We therefore have excellent evidence that we do not understand all of the causes of global temperature and that global warming as it is represented in the models is in error. Mann’s fourth error is to show how well the global-warming-assumption model can be made to fit past data. This fit is only of minor interest, because we could also get good fit with any number of probability models, and indeed Mann shows good fit for some of these models. But we know that probability models are silent on cause, therefore model fit is not indicative of cause either. To my thinking, assuming that “the observations provide us with T” and “T = A + N + I …………(1)” is the First Error, not the Fourth Error. But I’m not a statistician. Nic Lewis, a leading climate scientist in the UK, writes in an email that Mann’s latest study is a “scientifically valueless paper even if it is 100 percent correct.” That’s because there is “nothing in this study that considers the probability of the high, recently recorded temperatures having arisen in the case where there is an anthropogenic [man-made] component, but it is less strong than simulated by the CMIP5 models, e.g. because they are too sensitive.” He also says the “analyses” they cite in the study’s intro is an “editorial comment” by Michael Mann. And while Curry subscribes to the basic tenets of man-made global warming, Mann and some climate scientists consider her moderate views “anti-science.” They believe the sun, volcanic activity, and ocean oscillations play little to no role in Earth’s warming. This is despite any statistical warming since 2000. The Mann et al paper is assuming that “all of the warming has been caused by humans,” which “given our current state of knowledge is an unwarranted assumption,” Curry says. A note re Mann et al and my use of the word “residual” vs their use of it. The word “residual” in each case does NOT refer to the same data series. Mann et al (including Rahmstorf) are back-to-front in their approach. Instead of removing MDV, ENSO, noise etc to find the underlying “residual” which approximates the secular trend in the original data, they remove everything leaving what they think is MDV (it isn’t) and then call it the “residual” (contrary to what everyone else refers to as the “residual” or implies including Rahmstorf in his 2011 paper). Foster and Rahmstorf (2011) at least took the sensible approach and found a “residual” that very roughly approximates the secular trend. Singular Spectral Analysis (SSA) and Empirical Mode Decomposition (EMD) find this “residual”. Foster and Rahmstorf’s “residual” conforms (roughly) to my use of it and any “residual” found by SSA and EMD, and it is MDV-neutral in the strictest sense. This “residual” however, is NOT “the trajectory of anthropogenic warming” as Both Mann et al and Foster and Rahmstorf imply. “The trajectory of anthropogenic warming”, as Mann et al put it, is actually the MDV-neutral GMST “residual” WITH THE ADDITION OF anthropogenic forcing. It is NOT what Mann et al and Foster and Rahmstorf purport it to be. >“The trajectory of anthropogenic warming”, as Mann et al put it, is actually the [conventionally known] MDV-neutral GMST “residual” WITH THE ADDITION OF [theoretical] anthropogenic forcing. Mann ey al do not know the difference between theory and fact. I’ve always found it very amusing that denialistas will claim we should ignore future projections of warming because they are based on GIGO computer models, and then in the next breath claim that there has been no recent warming based on the satellite temperature records – which are GIGO computer models. RSS produces high-quality, carefully intercalibrated data,using uniform processing techniques, with a brightness temperature data record spanning multiple instruments over several decades. Lower troposphere validated by radiosondes and sea surface temperatures validated by in situ data. Carl Mears might be downplaying RSS but I don’t think he would be very happy that his technology is being described as a “GIGO computer model”. GIGO computer models seem to be all the rage. Can you do a course in them? Officials in the northern mountainous provinces of Lao Cai and Son La said the cold has caused at least VND36 billion (US$1.6 million) in losses, killed more than 600 head of cattle and destroyed large areas and vegetable fields. Nearly 200 cows, buffaloes, and goats died in nearby Lang Son Province and more than 4,000 hectares of crops have been affected. Based on observations from ships, buoys and in some cases satellites, data suppliers (NOAA and UKMO) use computer models (not the same as climate models) to determine the monthly, weekly and daily values of sea surface temperatures in the ice-free oceans. There are a number of factors called parameters that data suppliers can adjust in the computer models in order to produce their sea surface temperature end products. Parameters are commonly thought of as tuning knobs. The uncertainties shown in the histograms from Huang et al. (2015) are parametric uncertainties. That is, they are the uncertainties associated with the 24 parameters NOAA uses to “tune” the ERSST.v4 “pause-buster” sea surface temperature data. As shown in this post and in the post The Oddities in NOAA’s New “Pause-Buster” Sea Surface Temperature Product – An Overview of Past Posts, NOAA has selected those parameters so that the warming rates of their ERSST.v4 data reside at or near the extreme high ends of the ranges of parametric uncertainties for the periods of 1951 to 2012 and 2000 to 2014. I bet CTG didn’t know that. I didn’t. I don’t see how instrumental drift can explain the divergence between satellite and surface measurements of temperature. This makes some plausible statements about overlap between sensor types. Worth noting that much of the surface data that Renowden et al are so enamoured with is sea surface temperature, of which there is variation among datasets (see graphs at link below). # NOAA Optimum Interpolation/Reynolds OI.v2 – High Resolution (NOAA’s satellite-enhanced data/AVHRR-only, ¼-deg resolution, infilled, presented daily) KNMI recently added it to their Climate Explorer. # NOAA Optimum Interpolation/Reynolds OI.v2 – “Original” (NOAA’s original satellite-enhanced data, 1-deg resolution, infilled, presented weekly and monthly) I’ve listed it as “Std” for standard resolution and standard timeframes in the title blocks on the graphs. This is the Reynolds OI.v2 data I use in my monthly sea surface temperature updates. Satellites may also be used to retrieve surface temperatures in cloud-free conditions, generally via measurement of thermal infrared from AVHRR. Weather satellites have been available to infer sea surface temperature (SST) information since 1967, with the first global composites occurring during 1970. Since 1982, satellites have been increasingly utilized to measure SST and have allowed its spatial and temporal variation to be viewed more fully. For example, changes in SST monitored via satellite have been used to document the progression of the El Niño-Southern Oscillation since the 1970s. There’s a 1998 to 2005 sensor overlap in that statement. I think there’s more to it than that. Table 8o-1: Surface area of our planet covered by oceans and continents. And of that 29.2% of earth’s surface area covered by land, New Zealand, Australia, USA, UK, Africa, and probably Canada, did NOT return 2015 warmest in the records. This is “a measure of the temperature where we live” according to Gareth Renowden i.e. we don’t live in the ocean (or the lower troposphere as measured by satellites and weather balloons). Some discomfort in certain quarters when the El Nino spike returns to neutral. Total embarrassment if a La Nina ensues. This [see rest of comment] would suggest global warming may be changing the nature of el nino. I don’t see these big spikes in the early 20th century. Two 20 yr intervals, first in the early 20th century, second is the last 20 yrs of data. Both have large positive spikes but the difference is that the first interval has a large negative spikes too, the second doesn’t. Woe betide the warmies if there’s a large negative spike in the next decade. It is not out of consideration. No spike, The nature of El Nino completely changed. Global warming? In the Hot Topic thread, it reduces to abuse, as always. Ian Forrester is some kind of psychopath, who it would appear has a technical or academic position in Canada. Needless to say, I have been blocked from the hate site, but the psychopath Forrester continues with his manic rants against “deniers”. Completely and utterly barking mad. The 2015 spike is conspicuous in LOTI but all but disappears in “Our traditional analysis using only meteorological station data” (second graph down). In GISTEMP, as highlighted by Gareth Renowden, the 2015 “record-shattering” spike occurred ONLY in the Northern Hemisphere. And since the mid 1990s, the Northern Hemisphere has diverged radically from the Southern Hemisphere in GISTEMP. In the Southern Latitudes (which includes New Zealand) south of the tropical band, not only is there no spike, but the end of the series at 2015 is considerably DOWN on the immediate previous years. This entire “record-shattering global warm temperatures in 2015” beat up, is exclusive of most of the Southern Hemisphere. Note this is Northern and Southern Latitudes, not North and South Hemispheres i.e. excludes tropics. No records were shattered in the Southern Latitudes and 0.8 C less from normal than the Northern Latitudes, a third in other words. 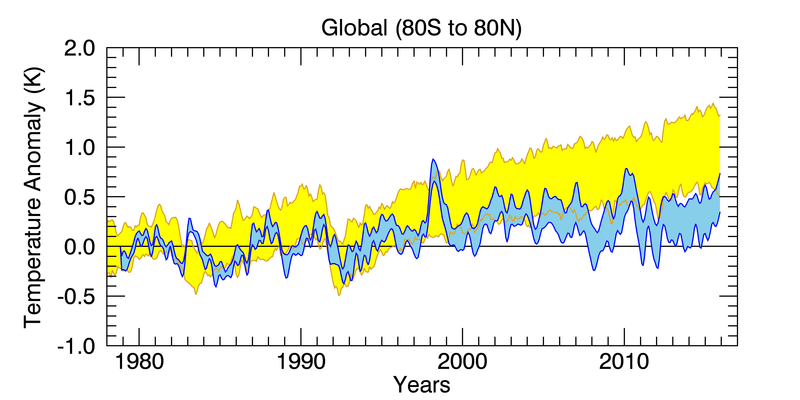 In the Southern Latitudes, 1980 was warmer then 2015 according to GISS. Set ‘Region’ to “South mid-latitudes (-60, -25)” and switch ‘History’ back and forth between “Full” and “Recent”. Again, as with GISTEMP, 1980 spiked warmer than 2015 according to RSS. Now relate Recent and Full to the NASA NEWS article headline ‘Analyses reveal record-shattering global warm temperatures in 2015’. Well, that’s enough abuse of the data for today. This is quite a good article by Roy Spencer explaining some issues around satellites, radiosondes and surface temperature readings. The 1979-2012 +/- error margins are larger for the ground based records (table 2.4, page 187) than they are for the satellite records (table 2.8, page 197). That stops them in their tracks. Not sure what Forresters point is with the RATPAC data but it is VERY useful in the context of 2015 (i.e. the topic). The 2015 record was a Northern Hemisphere phenomenon, exclusive of the land surface of Europe (2nd, KNMI), United Kingdom (not even close, UKMO data), United States (2nd, NCDC), and probably Canada (2014 25th, ECCC). Mike re January 2016 East Asia cold wave Wiki page – excellant. It was TROPICAL Taiwan that was extraordinary. A surge of cold air during the weekend of January 22–24 brought temperatures as low as 4 °C (39 °F) to Taipei, the lowest temperatures in 44 years. Yangmingshan, the Matsu Islands, and Kinmen all observed their coldest temperatures on record at −1.3 °C (29.7 °F), 0.3 °C (32.5 °F), and 1.3 °C (34.3 °F), respectively. Due to the tropical climate, most homes across Taiwan do not have central heating or insulation, and residents struggled to cope with the temperatures. There was a similar South American cold wave a few years ago when the cold actually crossed the equator into the Northern Hemisphere, “unprecedented” apparently. It lowered the temperature of lakes and rivers below the survival threshold of fish, turtles, alligators, dolphins, etc. It’s cold relative to what people are used to that does the damage, especially in the tropics. As I have said many times, “Warm good, cold bad.” Set the carbon free and let’s get some warm happening! Or, maybe delay the coming glacial. “By far the warmest” ? Notice that United Kingdom, and the globe’s longest running temperature record in particular (CET), is conspicuously absent from the Schmidt/Karl analysis. I suspect 1779 warmer than 2015 in CET may have something to do with that. It’s not something Schmidt and Karl would be comfortable trumpeting to the media. “2015 was by far the warmest year in the record” is by far their more preferable message. El Nino 2015 versus Global Warming 2015. Which caused the bigger temperature increase? Note that the regression of “Global Warming” uses 30 years of data i.e. to obtain the global warming “signal”. It’s not the theoretical CO2-forced model anthropogenic “signal” but ‘nuther story. Problem is, for periods less than 30 years and smoothed data eliminating ENSO noise, the global warming signal disappears. The 15 yr trend in HadCRUT4 5 yr mean is flat. The UKMO delves into 15 yr and 10 yr trends in their Decadal Forecast (see future post in this blog). We know from the linear regression that the temperature change due to Global Warming for 1 year is 0.0175 °C. In other words, El Nino was responsible for over 95% of the temperature change between the end of 2014, and the end of 2015. Global Warming was responsible for less than 5% of the temperature change between the end of 2014, and the end of 2015. But warmies like Grant Foster (Tamino) at Simon’s link upthread can’t have that, he retains the greater portion of the EL Nino spike as the global warming “signal”. Other warmies concur of course (see below). Rising greenhouse gases and a “small contribution” from the El Niño in the Pacific combined to cause the record temperatures in 2015, the Met Office’s Prof Adam Scaife tells Carbon Brief. How much of the record temperature in 2015 was down to El Niño? Does that mean human activity was the biggest driver of 2015’s record temperature? Carbon Brief has spoken to climate scientists working on this question, who all seem to agree El Niño was responsible for somewhere in the region of 10% of the record warmth in 2015. Dr Gavin Schmidt, director of NASA’s Goddard Institute for Space Studies, described the ongoing rise in global temperatures as having had “an assist” from El Niño. We think El Niño made only a small contribution (a few hundredths of a degree) to the record global temperatures in 2015. Schmidt estimated El Niño was responsible for 0.07C of the above-average warming we saw in 2015. A quick comparison of either Schmidt or Cropper’s numbers with NASA’s temperature anomaly for 2015 of 0.87C above the 1951-1980 average suggests El Niño contributed about 8-10%. Stott tells Carbon Brief: An estimate of less than 0.1C due to El Niño on 2015 global mean annual mean temperatures is less than 10% of the approximately 1C warming of 2015 relative to pre-industrial levels. Foster, Scaife, Stott, and Schmidt are effectively saying that the 2015 phenomenon, predominantly Asia/NH Pacific and absent from the SH Extratropics, is little more than ENSO-neutral in terms of temperature. They will all look like complete prats when conditions do return to ENSO-neutral later this year. Apparently, “global warming, itself mainly due to greenhouse gas emissions of human origin” (Scaife) rises ,11C per year (Schmidt). So by this warmist reasoning, a decade ago in 2006 the anomaly due to aGHGs was 0.68 – 1.1 = -0.42. The recorded anomaly was 0.5 therefore the difference, 0.92, was due to something else (what? can’t be 0.07C from an El Nino). Problem is, 30 yrs ago (1985/6) at 0.11C per year, the GHG-caused anomaly must have been around -3.3C BELOW the climate normal according to Schmidt’s increment. I don’t think Gavin Schmidt has thought this through. Written by James Edward Kamis, guest post on 04 February 2016. The reason these two very famous and supposedly different climate events look and act so similar is that they are actually not separate events, rather they are one geologically induced and continuous event. An event that is generated by a massive pulse of fluid flow from a major deep ocean fault zone located east of the Papua New Guinea / Solomon Island region. A compelling and credible theory attributing El Nino/La Nina to a geological event. Foster, Scaife, Stott, and Schmidt are claiming 90% of the 2015 El Nino temperature response for AGW. Graph 1 shows the HADCRUT4 monthly temperature anomaly plotted for the years 1880 to 2015. Also plotted is a LOESS curve for the HADCRUT4 data. The LOESS curve was generated using multiple local regressions, each regression using 20 years of data. Mosher says: “For grins.. take your time series and make a time series going back to 1880 using only el nino years Do the same for La Nina”. … and one gets a very good monthly model of Hadcrut4 all the way back to 1856 – over 1900 monthly datapoints. Then we pull out the natural variables and leave just the ln CO2 warming trend. Just a very consistent white noise series that approximates the actual CO2 warming over time (just back to 1979 so it more clear). Sorry, it is only about half of that predicted in the global warming theory and your cherished Climate Models. The “Warming Trend” in graph #3 is a residual similar to what statistician Grant Foster arrives at except Bill Illis starts with the entire dataset, not just the recent decades. What the likes of Foster neglect to tell everyone, probably because their assumption precludes it, is that the residual is not CO2-forced (contrary to Bill Illis’ miss-attribution), and that it certainly is not the same trajectory as the CO2-forced climate models. Needless to say, Foster easily fools our Simon. I’m inclined to think Foster fools himself too i.e. he’s actually ignorant of the situation rather than knowingly misrepresenting it (although I could be wrong of course). Bill removed 11-yr solar cycle change, not millennial solar change. His CO2 rationale falls apart if you go back 1000 yrs. NH phenomenon anyway but downhill from here on for a couple of years in a normal rational world. In Warmer World, Gavin Schmidt claimed all but 0.07C of the 2015 El Nino spike for AGW. The monthly mean is down about that much already in January 2016. If Schmidt is right (doubtful) the monthly mean should not fall any further. We”l know in a month’s time. I await the next Climate Clown installment with eager anticipation. In his comment to How much Estimation is too much Estimation?, Anthony Watts suggested I create a scatter plot showing station distribution with latitude/longitude. It turned out not to be the ordeal I thought it might be, so I have posted some of the results in this thread. I started with 1885 and created a plot every 20 years, ending in 2005. I deliberately ended with 2005 because this is the final year in the GHCN record prior to the US station die-off of 2006. Every dot on a plot represents a station, not a scribal record. Stations may be comprised of multiple records. A blue dot represents a station with an annual average that was fully calculated from existing monthly averages. A red dot represents a station that had missing monthly averages for that year, so the annual average had to be estimated. Stations that had insufficient data to estimate an annual average are not shown. In the case where multiple scribal records exist for a station in the given year, I assigned a blue dot if all records were fully calculated from existing averages, a red dot if at least one record was estimated, and no dot if none of the records could produce an estimate. I believe this errs in the direction of assigning more blue dots than is deserved. Hansen’s bias method mathematically forces estimation to occur during the period of scribal record overlap. The first plot shows coverage in 1885, five years into the GHCN record. 1905 shows improved coverage across the continental US, Japan and parts of Australia. A few stations have appeared in Africa. 1925 shows increased density in the western US, southern Canada, and the coast of Australia. At the end of WWII, not a lot of change is noticeable other than improved coverage in Africa and South America as well as central China and Siberia. In 1965 we see considerable increases in China, parts of Europe, Turkey, Africa and South America. A decline in quality seems to be apparent in 1985, as many more stations show as red, indicating their averages are estimated due to missing monthly data. A huge drop in stations is visible in the 2005 plot, notably Australia, China, and Canada. 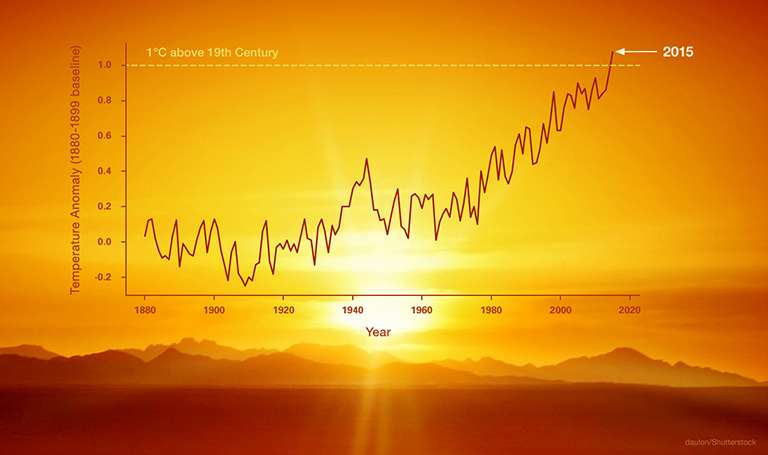 2005 was the warmest year in over a century. Not surprising, as the Earth hadn’t seen station coverage like that in over a century. The final plot illustrates the world-wide station coverage used to tell us “2006 Was Earth’s Fifth Warmest Year“. It’s like watching the lights go out over the West. Sinan Unur has mapped the surface stations into a beautiful animation. His is 4 minutes long and spans from 1701-2010. I’ve taken some of his snapshots and strung them into a 10 second animation. You can see as development spreads across the world that more and more places are reporting temperatures. It’s obvious how well documented temperatures were (once) in the US. The decay of the system in the last 20 years is stark. I wonder how Schmidt and Rahmstorf will spin this. Schmidt claimed all but “0.07C” of the 2015 Land+Ocean spike for AGW and Rahmstorf “more than 80%”. Problem is, now the Feb 2016 Land anomaly is 0.58 C higher than the Dec 2015 Land anomaly that made news headlines (2.37 – 1.79 = 0.58). This is 1.36C higher than only 6 months previously (2015.625 1.01). 2.37 (Land) is far and away the most spectacular anomaly in the GISTEMP dataset and more than 0.5 on what Schmidt claimed for AGW. So what to do? Double down and claim Feb 2016 too? I’ve yet to see a news headline on this. Have you seen the Feb 2016 anomaly yet? It might be time to turn the cognitive dissonance all the way up to 11. Ha ha! But why? Oh — do you allege mankind caused the temperature to rise, and this site ignorantly denies it? … and I’m sure a lot of otherwise well-informed people have gained quite the wrong impression from the lies put about by scientists like Gavin Schmidt and Mike Mann that the temperature has been rising for years. 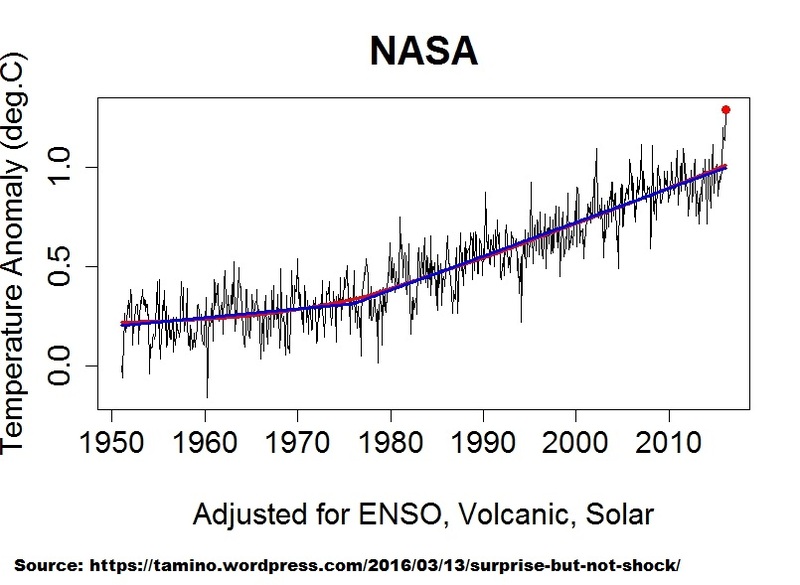 So Simon, is ENSO “noise” (a 2 month double peak spike in GISS Land above) now proof that “that the temperature has been rising for years”, as you imply by your RT quote and contrary to the rest of the 2015 GISS Land data? If spikes define “rising” temperature now (as opposed to ENSO-neutral noiseless data – I’m inferring from your comment), how do you explain 2008.208 (1.76) vs 2015.208 (1.79) ? Gavin Schmidt claimed ALL but “0.07C” of the 2015 anomaly for AGW. Applied to 2015.958 Land gives 1.72 attributable to AGW according to Schmidt. Apparently, 2008.208 El Nino data was ALL natural but 2015.208 was almost all AGW – how so? BTW Simon, if you actually followed this blog instead of just trolling you might keep up. Apparently AGW has abandoned the Southern Hemisphere. Global temperatures leapt in February, lifting warming from pre-industrial levels to beyond 1.5 degrees, and stoking concerns about a “climate emergency”. According to NASA analysis, average temperatures last month were 1.35 degrees above the norm for the 1951-1980 period. They smashed the previous biggest departure from the average – set only in the previous month – by 0.21 degrees. “This is really quite stunning … it’s completely unprecedented,” said Stefan Rahmstorf, from Germany’s Potsdam Institute of Climate Impact Research and a visiting professorial fellow at the University of NSW, noting the NASA data as reported by the Wunderground blog. The blog’s authors, Jeff Masters and Bob Henson, described February’s spike as “a true shocker, and yet another reminder of the incessant long-term rise in global temperature resulting from human-produced greenhouse gases”. The monster El Nino event had contributed to the current record run of global temperatures by increasing the area of abnormally warm water in the central and eastern Pacific. Compared with the rival record giant El Nino of 1997-98, global temperatures are running about 0.5 degrees hotter. “That shows how much much global warming we have had since then,” Professor Rahmstorf said. The first half of March is at least as warm, he added, and it means temperatures “are clearly more than 1.5 degrees above pre-industrial levels”. “We are in a kind of climate emergency now,” Professor Rahmstorf said, noting that global carbon dioxide levels last year rose by a record rate of more than 3 parts per million. “Governments have promised to act [to curb greenhouse gas emissions] and they need to do better than what they promised in Paris” at the global climate summit last December, he said. Australia has not dodged the heat, either, with record national temperatures falling at the start of March, the Bureau of Meteorology said in a special climate statement. The heat surge also comes as the future of climate science hangs in the balance in Australia , with the CSIRO planning to slash monitoring and modelling research. The most northerly latitudes of the planet were the most abnormally hot regions in February, with large areas reporting temperatures 12 degrees or warmer than average, the NASA data shows. The unusual heat in the far north means the Arctic sea ice will be thinner and more vulnerable to melting as the region heads into the warmer months, Professor Rahmstorf said. Arctic sea ice is already at its smallest extent for this time of year on record. The relatively warm seas are contributing to a warmer atmosphere, reinforcing the long-term trend. As the Wunderground blog noted, the impacts of the unusual global heat have been felt far and wide, including in severe droughts in Vietnam and Zimbabwe. Fiji, meanwhile, continues work to recover from Cyclone Winston, the most powerful storm recorded in the southern hemisphere. While February’s global heat spike is unlikely to be sustained as the El Nino winds down, the latest indicators “are all symptoms of the general warming trend”, he said. First they attribute the latest El Nino spike to “greenhouse gasses” (what about 2008?) and it is a “a kind of climate emergency”, then they say “February’s global heat spike is unlikely to be sustained as the El Nino winds down”. White man speak with forked tongue. What kind of “climate emergency” is that? Not surprising Rahmstorf is shocked and stunned. He’d already shot his bolt claiming “more than 80%” of 2015 for AGW. Bit late to ratchet up now 2016 is way higher. And 2007.042 (1.89) was higher again – ALL natural back then. AGW has just started pumping El Ninos apparently, strange phenomenon that it is. >“We are in a kind of climate emergency now,” Professor Rahmstorf said, noting that global carbon dioxide levels last year rose by a record rate of more than 3 parts per million. Annual global carbon dioxide emissions from fossil fuels could drop slightly in 2015, according to a report from the Global Carbon Project led by a Stanford University researcher. This surprising result contrasts with the rapid growth in emissions before 2014, underlining the need for action to stabilize and permanently lower global CO2 emissions, the researchers conclude. The new report, titled “Reaching Peak Emissions,” was published on Dec. 7 in the journal Nature Climate Change, with detailed data published simultaneously in Earth System Science Data. If fossil fuel emissions decline in 2015, record 2015 atmospheric CO2 level growth (or any growth) was El Nino driven i.e. by a natural driver – NOT driven by fossil fuel emissions. A recent paper published in Nature Climate Change finds a disconnect between man-made CO2 and atmospheric levels of CO2, demonstrating that despite a sharp 25% increase in man-made CO2 emissions since 2003, the growth rate in atmospheric CO2 has slowed sharply since 2002/2003. The data shows that while the growth rate of man-made emissions was relatively stable from 1990-2003, the growth rate of atmospheric CO2 surged up to the record El Nino of 1997-1998. Conversely, growth in man-made emissions surged ~25% from 2003-2011, but the growth rate of atmospheric CO2 has flatlined since 1999 along with global temperatures. The data demonstrates temperature drives CO2 levels due to ocean outgassing, man-made CO2 does not drive temperature, and that man is not the primary cause of the rise in CO2 levels. In this case Francey et al (2013). Long way short of Rahmstorf’s “climate emergency”. I made that up for chuckles. I’ll be interested to see how much of the 2015/16 El Nino spike (i.e. oceanic heat dissipation to the atmosphere) much of which claimed by Schmidt and Rahmstorf for AGW, is actually “trapped” by “greenhouse gasses” once the event has passed by. Given the usual reversion to neutral, I’m guessing zero at this stage. They are all part of a self-confessed media group dedicated to disseminating the latest climate alarm. “Hottest year ever” (2015) was cooler than 1980 in the SH Extratropics. So much for the “climate emergency”. El Niño forecasts show the current event is likely to weaken to so-called “neutral” conditions by the spring and summer, followed by the potential development of a La Niña cool phase. This would tend to dampen down the rate of global warming temporarily, which could yield fewer monthly records like February of 2016. However, if this occurs, it won’t mean that long-term global warming has stopped or reversed, but that it has just temporarily dialed back, likely to speed up again soon afterward. Somewhat anticlimactic (or is that anticlimatic?). What is amusing is that, irrespective of the imposed trend curve (basically just 2 linear trends – look closely), The 21st century ‘hiatus’ is clearly evident from the mid-2000s onwards. All Taminos “adjustment” does is move the pause along in time. This would be even more clear if Foster had actually removed the 2015/16 uptick. In other words, his trend line is missing a 3rd linear trend from about 2005 onward. Clearly, from 2010 onwards, the bulk of the data is BELOW Foster’s linear trendline. 2010 is significant here because 2010 was where the Foster & Rahmstorf (2011) residual passed through observations i.e. they “removed” very little of that spike too so the chances of Foster removing the 2015/16 spike were always going to be slim. Figure 4. Adjusted data sets for all five sources, after removing the estimated influence of el Niño, volcanic eruptions and solar variations. Obviously, Foster’s NEW “model” is different to the OLD F&R2011 residual in respect to GISTEMP. Note how the 2010 El Nino spike is prominent (warmest) in the OLD residual (GISTEMP, blue line) but is not a feature of the NEW “model”. Even by publication date of F&R2011 it was obvious that Foster would need a NEW model because addition of the then neutral data would make his residual look silly i.e. the neutral data was flatlining and the pause/hiatus was back – embarrassing. Even a massive spike as did occur was not going to help, no, a NEW “model” was required. So now Foster & Rahmstorf (2011) is thrown under a bus by Grant Foster himself, no less. Not much courage in his convictions. Advanced signal analysis is rather more revealing than Foster’s inept (and therefore non-contiguous) efforts. Foster, in his ignorance, will be out of options around 2020. His blind belief that the data trajectory is his linear residual will be undone in the intervening time. Firstly by a return to neutral conditions after the El Nino. Secondly by a very probable La Nina. Thirdly by a return to neutral after a La Nina. All of which will be BELOW his residual trendline, as was the post-2010 data BELOW his F&R2011 residual trajectory. Foster dug himself into hole. Now he’s tying himself in knots. Schadenfreude is fun. In the NASA GISS dataset, the 2015 SH Extratropics anomaly was cooler than 1980 (0.41 vs 0.46).